A deadly attack at a concert last year has only made Emmanuel Ngallos more determined to complete his "peace tour" of the Central African Republic, writes Brenna Daldorph. It is 11 November 2017 - a perfect Saturday night for a party. From his position on stage, keyboardist Emmanuel looks out at the excited crowd who have packed out the small bar to see his band, Nouvelles Ãcritures, perform. The air is thick with anticipation. Band leader Ozaguin, one of the country's most popular musicians, is making a rare appearance in Bangui's volatile PK5 neighbourhood, notorious for numerous outbreaks of inter-religious violence between militia groups. But the crowd feels hopeful because, unlike the rest of the country, the capital city has not witnessed serious violence for over a year. In the bar, Muslims and Christians from different neighbourhoods dance together, a rare sight that makes Emmanuel think peace is possible. A moment later, he sees something flying through the air towards him. It hits the speakers, bounces and rolls off the stage. Emmanuel was lucky to survive. "I'm the only survivor who actually saw the grenade," he says. "When it rolled off the stage, it fell into a little hole. That's what saved me. I was hurt, but alive." Four people died that day and more than 20 others were injured. It is still not clear who was behind the grenade attack but rumours spread like wildfire, triggering reprisal attacks. Several Muslim people were killed in retaliation, including a teenager who was dragged off his motorcycle by an angry mob. The Interior Minister later said the attackers had probably wanted to whip up tensions between communities. Emmanuel, meanwhile, lay in his hospital bed consumed with horror by the events that were unfolding. "I had expected a party and a good time, but it turned into the opposite," he said at the time. "That's how terrorists work - they replace joy with sadness." As chaos raged in the capital, Emmanuel had a series of important visitors including the Interior Minister, the EU ambassador plus a senior official from the UN's peacekeeping force in CAR, Minusca. But these visits just made him angry. Like many Central Africans, Emmanuel blames the authorities for letting the conflict drag on. Shrapnel wounds in his chest, stomach and back as well as the lacerations on his legs confined Emmanuel to hospital for days on end. To pass the slow, painful hours in between surgery he began dreaming up songs with messages about peace. Whispering melodies to himself, he would improvise lyrics as he went along. What is happening in Central African Republic? Russia has been leading its own peace process, hosting a meeting with a number of CAR's rebel leaders in Khartoum in August with Sudan. The move has been criticised by France's Foreign Minister Jean-Yves Le Drian who said "there is no alternative that is either desirable or is likely to succeed"
As the days passed, calm slowly returned to the capital. The streets bustled with market stalls, motorcycle taxis and pedestrians again. On a hot, sunny Thursday a week after the grenade attack, the horror seemed far away. That day there was a party atmosphere in central Bangui where people gathered for a beer festival, talking and drinking. Emmanuel's band members prepared to go on stage for the first time since the attack. Although Emmanuel was too weak to play, as he was still using crutches just a few days after leaving hospital, he could not resi st going along to watch. A steady stream of friends and musicians greeted him with hugs and slaps on the back, calling him "le ressuscitÃ©" - the man who had come back to life. Emmanuel believes this whole experience was part of his fate. "Nothing happens by chance," he says. "I have no hate for the Muslim community or anyone else. God knew something like this would happen and I would experience a shock." Why is Russia cosying up to the CAR? Seven months after November's grenade attack, Emmanuel and his band Nouvelles Ãcritures set off on a peace tour of 14 different cities in CAR. A UN-backed initiative to bring rival communities together - each performance has taken place under the watchful eye of by peacekeepers. One of the band's newest songs, called Carrefour de la Paix after the name of the bar where the grenade attack happened, tells the story of the ordeal. Suddenly, I heard a noise. When I turned around, I saw everyone was on the ground. The plastic chairs were broken. That day, I cried so much. I thought, it is my fault that the people there were injured and lost their lives. Emmanuel says it was important to commit those difficult memories to song. 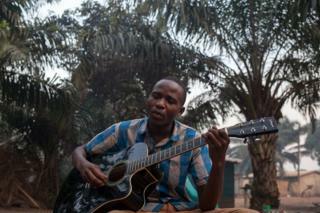 "Even after I was injured in the grenade blast, we didn't want to stop making music. "It's our career, our choice, our passion. We'd rather be martyrs for peace in the Central African Republic than stop," he adds. The trauma is something Emmanuel is trying to come to terms with. "Whenever someone hits something or slams a door, I hear the soun d of the grenade in my head. "At night, I can't sleep. When I close my eyes it's like I'm watching a movie of what happened." The CAR is still locked in conflict, with 14 active armed groups fighting over land and resources. The band had to cancel a scheduled appearance in the town of Bambari when clashes broke out there just hours ahead of the show. The second half of the tour was meant to take place this summer but was suspended after a new outbreak of fighting across the country. Emm anuel says that despite everything he still thinks there is hope for peace. In the meantime he'll keep playing. And, one day, he vows, he will finish the tour.